A kind of neo-Western in the worst sense of that formerly idealized notion, Joel and Ethan Coen’s No Country For Old Men is biblical, meditative but also a brash, horrific and even comical post-modern cowboy dystopia where saddles, spurs and cowpokes have been replaced with Uzi’s, dope smugglers and drug massacres along the Tex-Mex border. Adapted from the popular 2003 novel by Cormac McCarthy and visually crafted from the panoramic, lean and luminous lens of master cinematographer Roger Deakins, the film manages the feat of both utter shock with the raw truth of depraved, meaningless violence, while calling into question how that reality has come to permeate and dominate modern existence. Tommy Lee Jones is sullen, jaded and perplexed Sheriff Bell, a rural Texas lawman who wanders the bleak landscape in a bewildered state of mind as an aging man who has lost his sense of purpose in the world. Having fallen out of touch some time ago with a society dominated by border drug wars and steeped in greed, casual brutality, an insatiable hunger for money and the cruelty necessary to obtain it, Bell muses out loud about the loss of any moral anchor he imagines the elders like his father or God embodied. 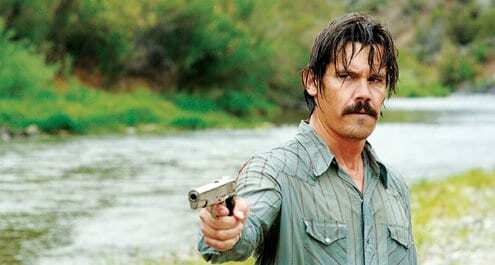 Meanwhile out in the surrounding wilderness, a trailer park local and Viet Nam veteran Llewlyn Moss (Josh Brolin) who’s been out hunting antelopes comes across the scene of a bloody gang shootout, an apparent big drug deal gone bad. When Moss spots a briefcase with two million dollars among the dead bodies, he takes off with the money to a motel in the next town. But unknown to Moss, is that the briefcase contains a sensor tracking device, and Anton Chigurh (Javier Bardem) the furious varmint with ticking sensor meter in tow and a ruthless psychopath to say the least, is hot on his trail. With a frightening leer, neatly coiffed boyish bowl cut and soft-spoken, intimidating grace while toying with randomly chosen kind hearted, salt of the earth country folk he giddily dispatches to the afterlife along with way, Bardem’s sadistic fiend has got to be the most ghoulish homicidal maniac around since Jack The Ripper. And try as he may to elude this apparently high IQ monster and make off with the cash, at one point sneaking across the Mexican border riddled with bullets and covered in blood only to wake up on the street the next morning to find himself serenaded by a mariachi band, Moss is no match for this determined stalker, or the equally ripped off Mexican drug gang gunning for them. Nor the dapper gumshoe for hire, Carson Wells (Woody Harrelson) recruited to track them both down, who visits Moss in the Mexican hospital where he’s recovering, bearing a big bouquet of flowers and some prudent, unheeded advice that he just call it quits. But the real main character in all this assorted ensemble mayhem, is the money. And though the Coen brothers as usual delight in messing around with audience expectations, and whether or not an appropriate response is laughter or dread at any given time, they’re dead serious when it comes to their own feelings about the deplorable state of the world right now. And exactly the role that money plays, in corrupting people, driving them to extreme acts of desperation and depravity, and dehumanizing everyone around them in the process. No Country For Old Men is ultimately, oddly, a cautionary romantic tale, a story of money love, how it courses its way through the bloodstream of the human race like a contagion, the symbolic darkness in man, and dividing those it touches and infects, from one another. And Tommy Lee Jones’ sheriff, whose contemplations bookend this extraordinary film as mournful voiceover, is left to helplessly ponder and lament the seeming disappearance of any moral center from the planet, and the decaying abyss of a shaky future.